Symone Walters identifies first as a mother and then as a community activist and social entrepreneur. Tragically, in the summer of 2013 Symone lost her youngest son, Tahj Loor-Walters, to gun violence. He was 15 years old. Symone has vowed to turn tragedy into inspiration! 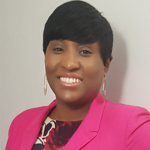 Symone received her diploma in child and youth services from George Brown College and reoriented her career to one that is entirely dedicated to serving youth, particularly Black youth. In her previous role in partnership with the DUKE Heights BIA (Business Improvement Area) and Osgoode Hall Law School–York University, and currently as a project manager with the Toronto Community Benefits Network (TCBN), Symone has had the opportunity to build relationships between the University and the local community through initiatives that focus on sector strategies and youth employment.